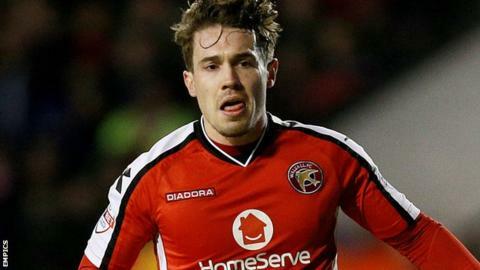 Walsall top scorer Tom Bradshaw's brace helped the Saddlers to a comfortable win over Oldham. Walsall began strongly and were rewarded when Bradshaw chipped Kieron Morris' smart pass over Joel Coleman. Bradshaw then registered his 20th goal of the season with a penalty after Mal Benning was fouled by Liam Kelly. Walsall boss Dean Smith has dismissed speculation linking him to the managerial vacancy at Championship strugglers Millwall. "As far I'm concerned it's a rumour," Smith told BBC WM. "There's always rumours in football linking people with jobs all over the place. There's nothing you can do about that. As a football club we've had no contact from Millwall at all." Danny Philliskirk was the only Oldham player to trouble keeper Craig MacGillivray but his low effort was easily saved. Walsall, who extended their unbeaten run to seven games with a third straight home win, move up to 11th place in League One. Against an Oldham side under the temporary management of former Saddlers player-coach Dean Holden, the Saddlers gave a debut in goal to MacGillivray, as they await a decision over first-choice Richard O'Donnell's future. "There were plenty of positives and seeing Tom Bradshaw reach 20 goals was certainly one of them. It's a fantastic achievement for the lad. "Our performance levels have been high in recent weeks. The players have deserved to keep their place and that's why I haven't made many changes. "I was delighted that Craig MacGillivray came in and kept a clean sheet. He looked steady and calm on the ball and it was an accomplished senior debut from him. "Whilst we are hopeful that Richard O'Donnell will stay, I had to take a look at Craig today and Richard understands that." "Walsall are a good team, they moved the ball really well and when we got hold of the ball, we moved it really well ourselves. "We got to the final third of the pitch and we just didn't have enough. We were too negative. "We try to say to the players have some freedom, take the shackles off, go and make things happen, excite people, get them out of their seats - but too many times we took the easy option. "We didn't test their keeper enough." Match ends, Walsall 2, Oldham Athletic 0. Second Half ends, Walsall 2, Oldham Athletic 0. Corner, Oldham Athletic. Conceded by Ben Purkiss. Ben Purkiss (Walsall) wins a free kick in the attacking half. Foul by Rhys Murphy (Oldham Athletic). Sam Mantom (Walsall) wins a free kick on the right wing. Foul by Jordan Bove (Oldham Athletic). Foul by Ben Purkiss (Walsall). Rhys Murphy (Oldham Athletic) wins a free kick in the defensive half. Substitution, Walsall. Romaine Sawyers replaces Michael Cain. Attempt missed. Sam Mantom (Walsall) right footed shot from the left side of the box is close, but misses to the right. Substitution, Oldham Athletic. Rhys Murphy replaces Rhys Turner. Attempt blocked. Jordy Hiwula-Mayifuila (Walsall) right footed shot from the centre of the box is blocked. Substitution, Oldham Athletic. Jordan Bove replaces Dominic Poleon. Foul by Michael Cain (Walsall). Corner, Oldham Athletic. Conceded by Sam Mantom. Attempt missed. Michael Jones (Oldham Athletic) right footed shot from outside the box is just a bit too high. Attempt missed. Michael Cain (Walsall) left footed shot from outside the box is close, but misses to the left. Corner, Walsall. Conceded by Liam Kelly. Jordy Hiwula-Mayifuila (Walsall) wins a free kick in the attacking half. Substitution, Oldham Athletic. Carl Winchester replaces Timothee Dieng. Substitution, Walsall. Reece Flanagan replaces Adam Chambers. Second Half begins Walsall 2, Oldham Athletic 0. First Half ends, Walsall 2, Oldham Athletic 0.